FTP server software: RaidenFTPD is an easy-to-use FTP daemon for Windows™. With this little tool you can share your files with friends, provide file download host services to customers or even setup your own home network FTP server. Not only are all the basic FTP features built-in; it also features various advanced features such as SSL/TLS, UTF8(unicode), MODE-Z(compression), UPnP NAT router traversal and more .. It also has the flexibility to collaborate with Router&Firewall flawlessly and is compatible with Internet Explorer 6-9. Download and setup a FTP server for Your PC in 3 minutes with RaidenFTPD! Buy a FTPd software at 50% price of similar products! Get professional FTP server software consulting service for FREE! RaidenFTPD is designed for everyone from home to enterprise admins. It features bandwidth restriction features such as global speed limits, bandwidth restrictions and is optimized for 100m/1000m bit Ethernet to offer the highest speed possible. File Transfer Protocol (RFC-959) does not effectively address security. Packets are all transferred in clear text. RaidenFTPD supports FTP over SSL/TLS 1.2 secured and encrypted file transfers, secured server to server transfers via SSCN, and the OTP. Raiden has an easy-to-use GUI and will automatically setup your UPnP router! It even configures your firewall! RaidenFTPD server software comes with real-time monitoring features so you can watch your users activities live. Raiden FTP server Virtual File System is very powerful. It allows you to setup a server that contains files from multiple drives or paths. It can also merge several paths into one, as well as link other RaidenFTPD servers using our own VLS protocol. RaidenFTPD comes with a programming interface. You can write your own addon programs to process files and users against more than 30 events. It also supports ODBC so you can integrate your server with the database system you have. RaidenFTPD FTP server software is fully compatible with Windows XP and Windows 7, setting up an FTP server has never been so easy like counting 1-2-3. Plus that it is an FTP server software that works great with internet routers and firewalls. Also, there are many FTP script authors who wrote extension scripts for RaidenFTPD FTP server, if You know some programming skills, You can also expand the features of your FTP site by yourself. 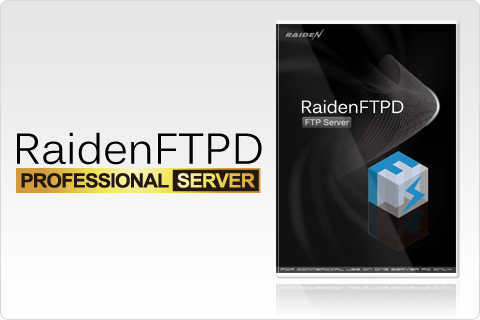 RaidenFTPD FTP server had been around for more than 12 years, and there are already tens of thousands of FTP site owners who choosed Raiden, We recommend you to give RaidenFTPD FTP server a try, You will like it!